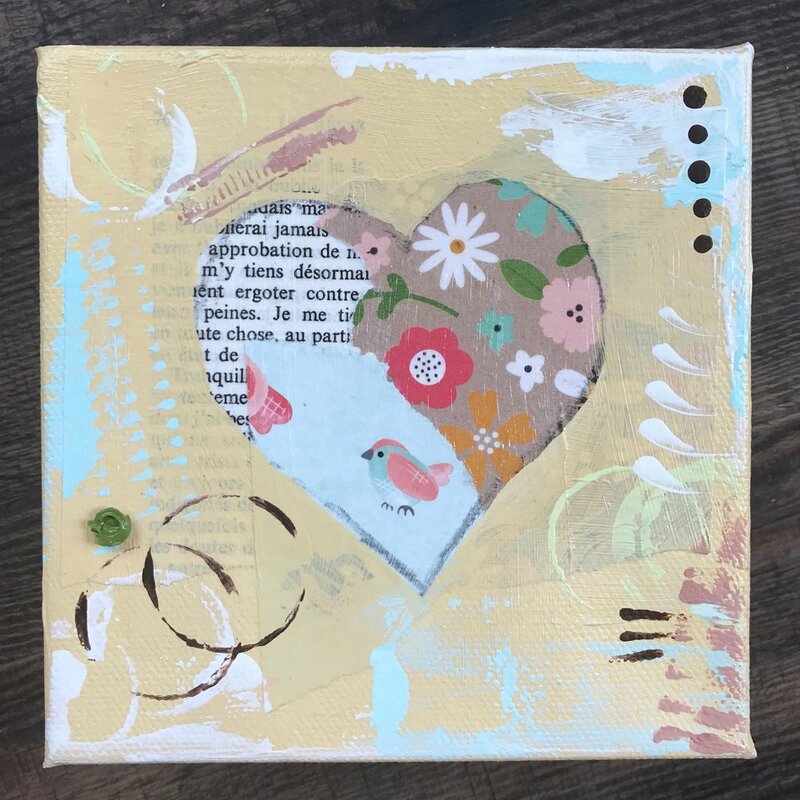 A little birdie told me to share the love (5" square canvas, $33 plus shipping). One of the things I love to make are collage pieces that use a combination of papers and acrylic paints. Lately, I was thinking how much I love my husband (must have been all that together time on our Sedona vacation, or maybe the new studio, of which I still owe you a tour), and how much I love my kids (my daughters are two of the most amazing individuals I know), and I started making a series of hearts. 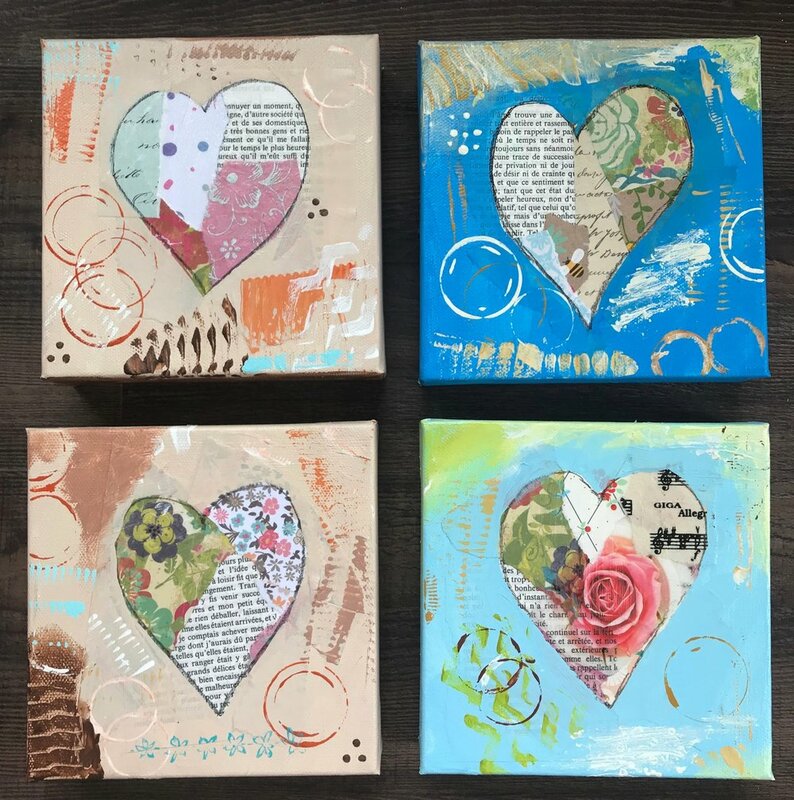 All of the heart pieces I've made (and I've been on a bender with this series, so I've made quite a few of them) are on square, gallery-wrapped canvases. All of them include papers, acrylic paint, and Stabilo All pencil. They are either on 5" squares, like the piece above and the light green series below, or (far more likely) on 6" square canvases, like the blue, pink, orange, and yellow ones. I am planning on taking all the hearts I have (my own included!) with me to the Williamstown Arts Festival, where I'll be showing and selling art on Saturday, April 28th from 12 noon until 5 p.m. (There is a rain date of April 29th.) They'd be perfect for an engaged couple. Or for a wedding or wedding anniversary gift. Or for a birthday gift. Or to welcome a new baby. Or for Mother's (or Father's) Day. Or for pretty much any occasion where you want to share a bit of love. Orange, because my cousin Martha said "how about some orange ones?" 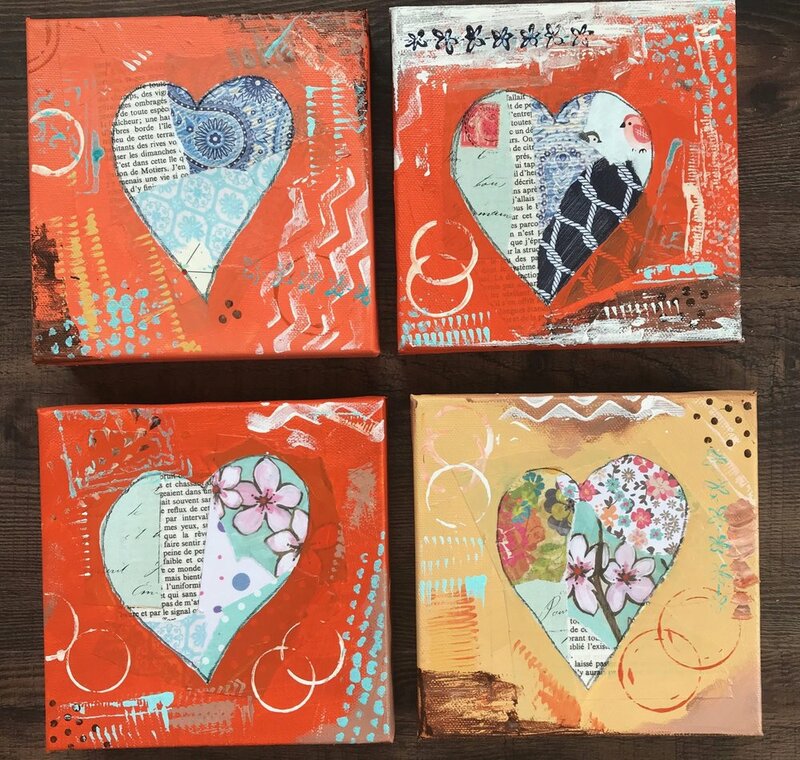 I did a series of six hearts using varying shades of blue paint on 6"x6" canvases. The other two you see with them in the photo on the right (above) are from the orange series, though they are somewhere in the orange/tan zone. All of the blue and orange canvases are $47 each, plus shipping. Green is such a happy spring color, isn't it? As Robert Frost said, "Nature's first green is gold." Four pink hearts (well, three that are overtly pink, and one that I consider pink-adjacent) are in that first, slightly wonky photo above. And there are two that are yellow, which doesn't look quite as acidic in person, though they are indeed a happy, bright yellow. Stay tuned for more about the upcoming Arts Festival (which I'm told will include shuttle buses between the two new Williamstown breweries! ), a studio tour (man, do I need some storage first), and photos of my artwork at the exhibition that's going up tomorrow at the West Deptford Library!